• Decision makers that are typically at the Owner, Director, VP or C level of contact. • Long sales cycles that after a lead is developed require our clients to make multiple sales calls (typically over a period of time) to close a deal. These sales typically have large deal sizes. • Sales that require multiple sales calls (typically over a period of time) to close. 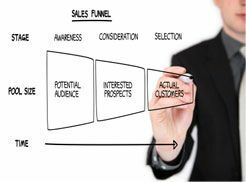 Typically our clients are utilizing a “solution sell process” and therefore require lead generation where prospects have a challenge, problem or issue that needs to be resolved. Our excellent b2b lead generation services make us the top lead generation company in the USA & Canada. Join over 6,000 business owners and sales professionals discussing a range of sales topics such as Sales Lead Generation, Lead Management, Appointment Setting, Lead Generation, and Content Marketing. Now we are ranked #1 lead generation companies at clutch. How We Compare to Other Vendors?